Macroautophagy/autophagy is a lysosome-dependent catabolic process for the turnover of proteins and organelles in eukaryotes. Autophagy plays an important role in immunity and inflammation as well as metabolism and cell survival. Diverse immune and inflammatory signals induce autophagy in macrophages through pattern recognition receptors, such as toll-like receptors (TLRs). However, the physiological role of autophagy and its signaling mechanisms in microglia remain poorly understood. Microglia are phagocytic immune cells that are resident in the central nervous system and share many characteristics with macrophages. 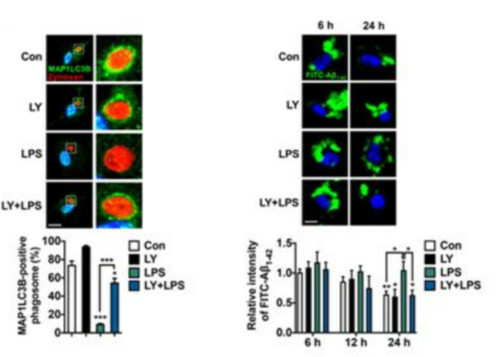 Here, we show that autophagy flux and expression of autophagy-related (Atg) genes in microglia are significantly suppressed upon TLR4 activation by lipopolysaccharide (LPS), in contrast to their stimulation by LPS in macrophages. Metabolomics analysis of the levels of phosphatidylinositol (PtdIns) and its 3-phosphorylated form, PtdIns3P, in combination with bioinformatics prediction, revealed an LPS-induced reduction in the synthesis of PtdIns and PtdIns3P in microglia but not macrophages. Interestingly, inhibition of PI3K, but not MTOR or MAPK1/3, restored autophagy flux with concomitant dephosphorylation and nuclear translocation of FOXO3. A constitutively active form of FOXO3 also induced autophagy, suggesting FOXO3 as a downstream target of the PI3K pathway for autophagy inhibition. LPS treatment impaired phagocytic capacity of microglia, including MAP1LC3B/LC3-associated phagocytosis (LAP) and amyloid β (Aβ) clearance. PI3K inhibition restored LAP and degradation capacity of microglia against Aβ. These findings suggest a unique mechanism for the regulation of microglial autophagy and point to the PI3K-FOXO3 pathway as a potential therapeutic target to regulate microglial function in brain disorders. 국내 연구팀이 자가포식 작용과 알츠하이머병과의 연관성을 찾았다. DGIST는 뇌·인지과학전공 유성운 교수팀이 뇌 면역세포인 미세아교세포의 자가포식 작용이 염증자극에 의해 조절되는 새로운 메커니즘을 규명했다고 8일 밝혔다. 수고하셨습니다 ! 한빛사인터뷰를 통해 뵈니 또 새롭네요 !! 항상 응원하겠습니다 !! !